Khardeen Shillingford focuses her practice in consumer and class action litigation. She represents mortgage lenders, servicers and investors in state and federal actions alleging mortgage fraud, predatory lending, violations of state and federal consumer protection statutes and claims brought under TILA, RESPA, and HOEPA. Ms. Shillingford has experience in all phases of litigation, including conducting discovery, drafting motions, and preparing for trial. Her federal practice includes the representation of secured creditors in adversary proceedings and objections to claims filed in New York Bankruptcy Courts. Ms. Shillingford also handles white collar criminal matters on behalf of brokers, executives and corporations. She has second-chaired criminal cases in New York State Supreme Court, including an 11-month trial where three former executives were acquitted of felony charges stemming from alleged violations of New York’s anti-trust statute, the Martin Act. 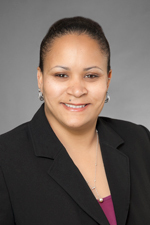 Ms. Shillingford joined Hinshaw & Culbertson LLP as an associate in March 2007. Previously she was a paralegal with the firm since September 2006. From 2001 to 2005, Ms. Shillingford was a legal assistant and intern with Maranda E. Fritz, P.C., and for three years an office manager and legal assistant with Fritz & Miller, P.C. Co-author of “Expunging a Criminal Past,” which was published in the White Collar Supplement of the New York Law Journal, February 14, 2011.